2019 has been a historic year for public higher education in the Commonwealth. Thanks to a series of recent state and institutional policy decisions, Virginia’s colleges and universities are on a track to more transparency, accountability, and affordability. Up until this year, the trendline of skyrocketing tuition and fees in Virginia, having risen 80 percent in the past decade, showed no signs of slowing. Some institutions had raised tuition for 17 straight years as a springtime ritual of sorts. 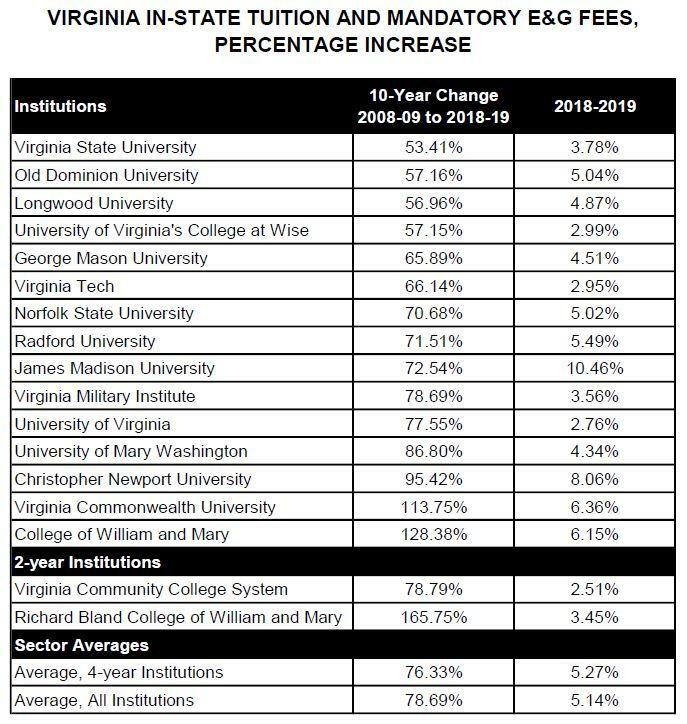 Just last year, tuition and fees increased an average 5 percent across all public two- and four-year institutions in the Commonwealth, bumping Virginia up one spot to #6 for highest tuition and fees in the nation for public four-year institutions. And until recently, students and families had limited opportunities to express their thoughts and concerns with those entrusted to make decisions on behalf of Virginia’s public hubs of higher learning. While many public boards and commissions have long been required by law to solicit public input through holding public comment periods, Virginia’s public colleges and universities have long been exempted from the rule. While a small number of institutions had rules for permitting public comment at their governing board meetings, such as Longwood University and Virginia Military Institute, the vast majority did not. 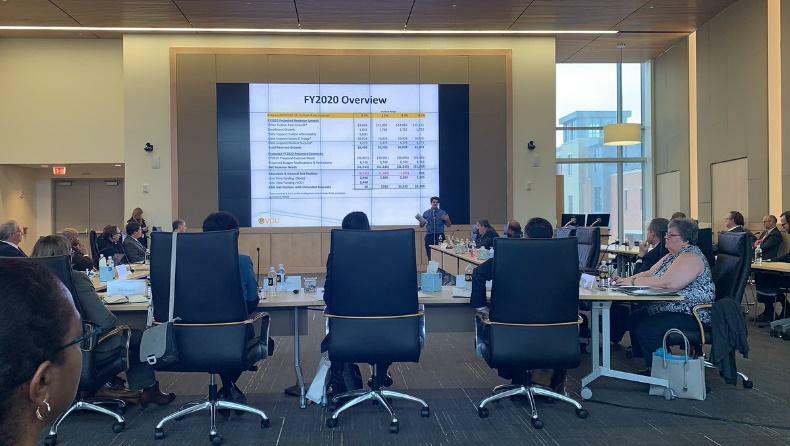 When Virginia Commonwealth University proposed up to an 8.1 percent increase in tuition and fees last year, a diverse coalition of students came together in a united stance against the hike. In the absence of a public comment period, student leaders were unable to voice their concerns to the Board of Visitors directly and were left handing paper copies of student statements and 400 petition signatures to university leaders before the board meeting began. A 6.4 percent increase in tuition and fees was ultimately approved. Thanks to efforts by state lawmakers and institutional leadership alike, Virginia’s students and their families will soon be the beneficiaries of a temporary – but very significant – reprieve from rising college tuition. And these students and the public will have a permanent platform to influence governing board decisions. Earlier this week, Virginia Tech became the first institution to formally accept the General Assembly’s tuition moderation funding as the Board of Visitors voted unanimously to freeze in-state, undergraduate tuition. Last week, the college board of University of Virginia’s College at Wise voted to roll back a previously approved 3 percent tuition increase, a decision that is currently pending approval from the University of Virginia’s Board of Visitors. Several other university leaders and administrations have already announced their support for freezing tuition in advance of their respective board meetings, including Virginia Commonwealth University (VCU), Christopher Newport University, the College of William and Mary (W&M), George Mason University (GMU), Old Dominion University, Radford University, and the University of Mary Washington. These Boards of Visitors will meet over the next several weeks, where they will vote on proposed rates for the 2019-20 academic year. Ahead of these decisions, some boards have held public comment periods for students and members of the public before the state mandate even takes effect. 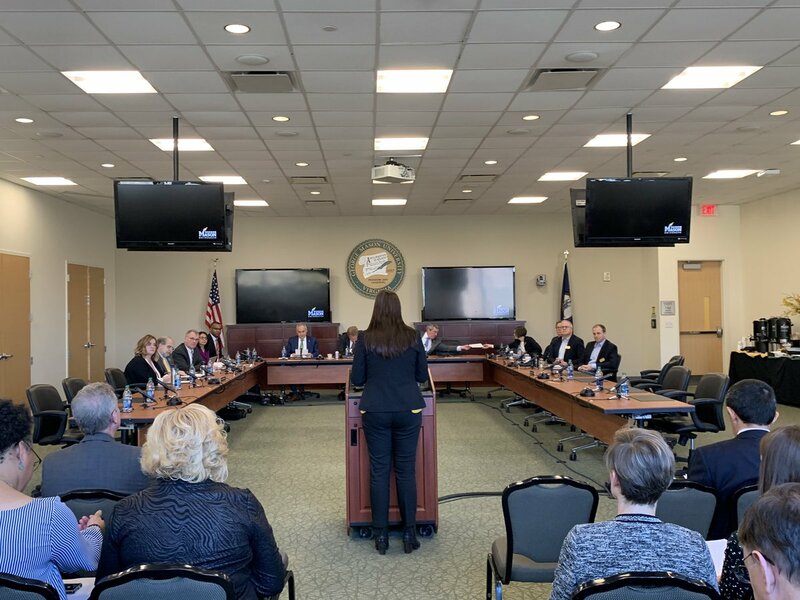 W&M held a public comment session in March with a small group of board members present, replicating a format they introduced last fall. GMU gave students a similar opportunity last week following a packed board committee meeting.